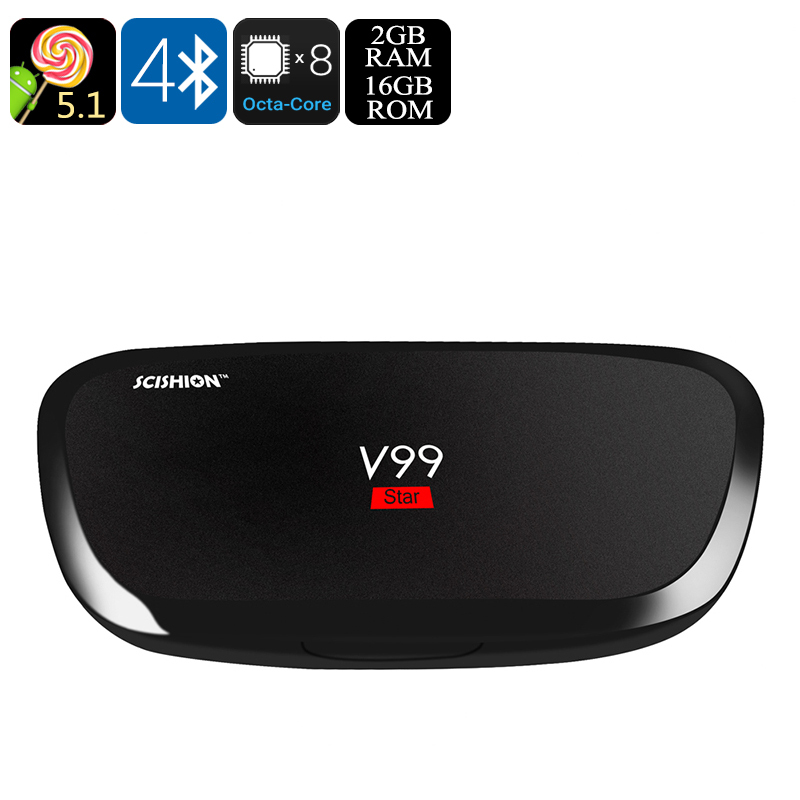 Successfully Added SCISHION V99 Star TV Box - Rockchip CPU, 2GB DDR3 RAM, Kodi, DLNA, Dual Band Wi-fi, PowerVR GPU, Android OS to your Shopping Cart. This Android TV Box is the SCISHION V99 Star, containing a Rockchip 3368CPU and 2GB of super fast DDR3 RAM this Android TV box can play 4K video perfectly. So if you want to make your 4K TV smart then this affordable TV Box is the way to do it. With and Android OS this TV box brings a tried and tested interface that's just like that on your Android Smartphone so you'll find it easy to navigate. Just connect it to any HDMI screen or TV for a full media center experience. With its wireless 802.11 b/g/n/ac connectivity you can enjoy the faster speeds of dual band Wi-Fi which offers a great performance for streaming video and media wirelessly and can take advantage of 5Ghz network connectivity as well as the common 2.4Ghz frequency. The V99 Star TV box has optical SPDIF port for connecting external speakers and can deliver high quality audio without any noise or interference. As well as all the streaming and media apps available through the Google Play store this TV Box comes preinstalled with the Kodi media player, one of the leading apps for finding and steaming online contented with thousands of repositories and channels to connect to. Bluetooth 4.0 and two USB ports offer connectivity for peripherals such as mouse and keyboard while DLNA support provides wireless sharing so you can share the screen content from your mobile phone or tablet PC to this Android box and view it on your TV. With 16GB of internal storage and 32GB of external storage supported through the micro SD card slot you'll have plenty of room for games and apps on this Android TV Box. The SCISHION V99 Star Android TV Box comes with 12 months warranty, brought to you by the leader in electronic devices as well as wholesale Android TV Boxes..